A witness to the UK’s most famous UFO sighting says he may be suffering from the effects of radiation, and in a recent press release, points out that a UK Defence Intelligence (DI) report suggests that he may have been exposed to UFO radiation. Meanwhile, the U.S. Air Force says they have lost his service and medical records from that time. 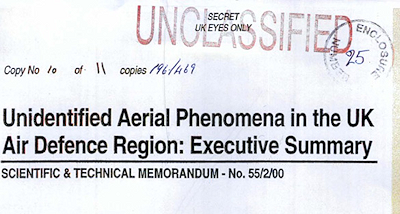 It was reported this week that the UK Ministry of Defence (MoD) has admitted that they will be releasing more UFO files, despite having said that they had already released all of their UFO files. This current revelation has been due to the efforts of John Burroughs, a military witness to the UK’s most famous UFO sighting. Burroughs says he has been seeking official answers as to what he might have experienced that night in December, 1980 when he and others witnessed a UFO. At the time, Burroughs was a U.S. Air Force security officer stationed at RAF Bentwaters in Suffolk, which, along with nearby RAF Woodbridge, was on lease to the U.S. Air Force. It was actually a Freedom of Information Act Request (FOIA) he made in December that prompted the MoD to release these newly found UFO documents. However, coincidentally, the MoD did not actually post that information publicly until September 16, the day after Burroughs sent out a press release to many UK media outlets alerting them to his plight. . . .